2013: Best of What's New award to the shake table from Popular Science: "The 2013 Best of What's New"
PBS: "NOVA Making Stuff Safer"
UT San Diego: "Video: Quake engineers topple building"
10 News: "Engineers test building retrofits, work to improve how structures survive shaking"
CBS 8: "Shake table experiment brings down the house"
BBC News: "Engineers Launch Artificial Quakes at 'Hospital' BBC News"
NBC News: "Preparing for the big one"
CBS News: "With Man-made Quakes, Engineers Test Lifesaving Technologies"
The New York Times: "In California Quake Researchers, Boring is the Hoped-for Result"
Huffington Post: "California Earthquake Test Looks for Ways to Shore Up Hospitals"
USA Today: "Quake tests looks for ways to shore up hospitalsCalif. engineers to rock 5-story building in huge quake test"
Popular Mechanics: What happens when a mega-earthquake strikes the U.S.? LA Times: "Scientists shake out clues to earthquake damage"
Science Daily: "Rigorous Earthquake Simulations Aim To Make Buildings Safer"
LA Times: "UCSD quake simulation tests strength of precast concrete"
Project: Seven-Story Building at UCSD Rattled on Largest Earthquake Shake Table in U.S.
ABC 10 News: "UCSD Enginners Put Seven-Story Building To Test"
Symmetry Magazine: "Sciences on the Grid"
Labels: "englekirk center", "Joel Conte", "Jose Restrepo", "seismic safety" earthquake, "shake table", "Tara Hutchinson"
A team led by Jacobs School alum Nick Morozovsky won the MEGA Startup Weekend event this past weekend at the downtown San Diego Library with Daybreaker, a smart alarm clock that connects to your smartphone and the lamp on your nightstand. Morozovsky recently earned a Ph.D. from the Department of Mechanical and Aerospace Engineering. He is the creator of SkySweeper and worked on MiP, the first self-balancing consumer robot. Both won a Best of What's New Award from Popular Science in 2014 and 2013. He also worked on Switchblade, a search and rescue robot capable of climbing stairs. During the MEGA Startup Weekend, inventors had to pitch and idea, form a team and build a prototype, all in three days. 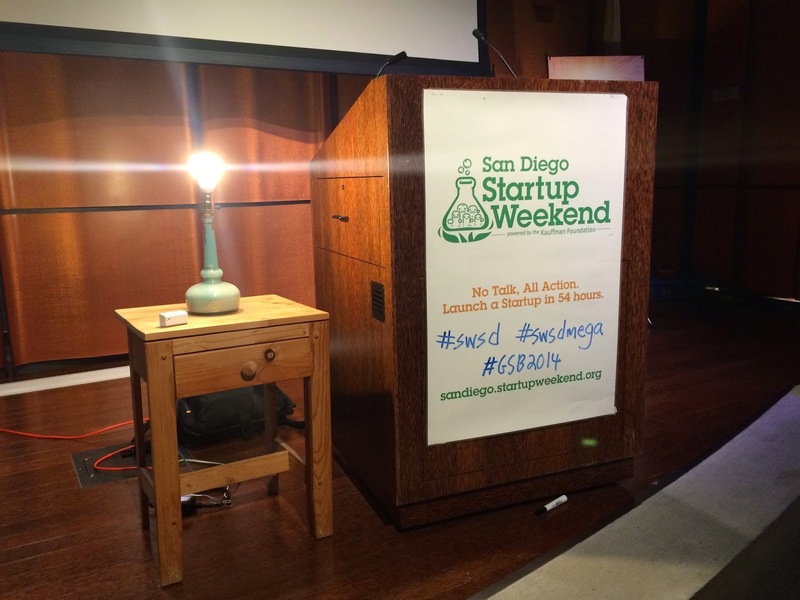 “Startup Weekend was a great (and intense!) event where I was able to get the full experience of launching a startup in only 54 hours," Morozovsky said. "Working with my team and networking with other entrepreneurs was empowering, winning first place was icing on the cake." 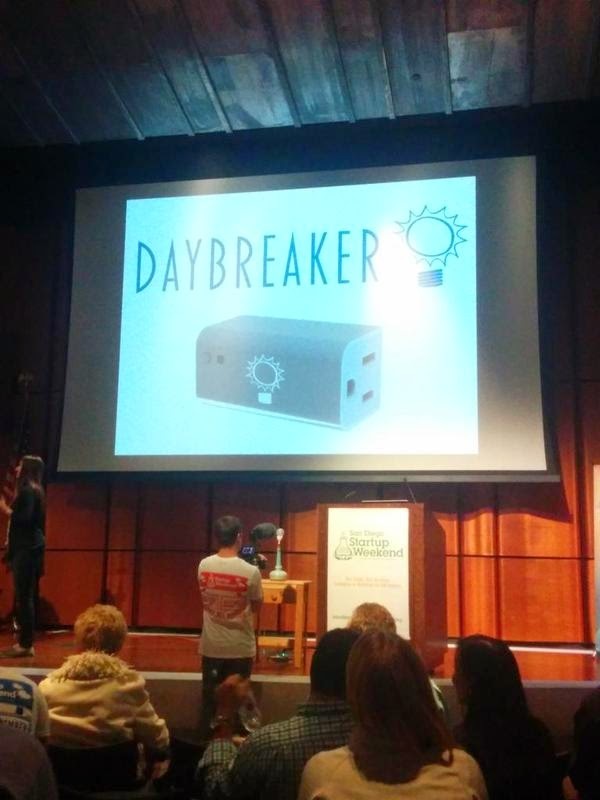 The Daybreaker team is now entering the Global Startup Battle and further investigating commercialization options. 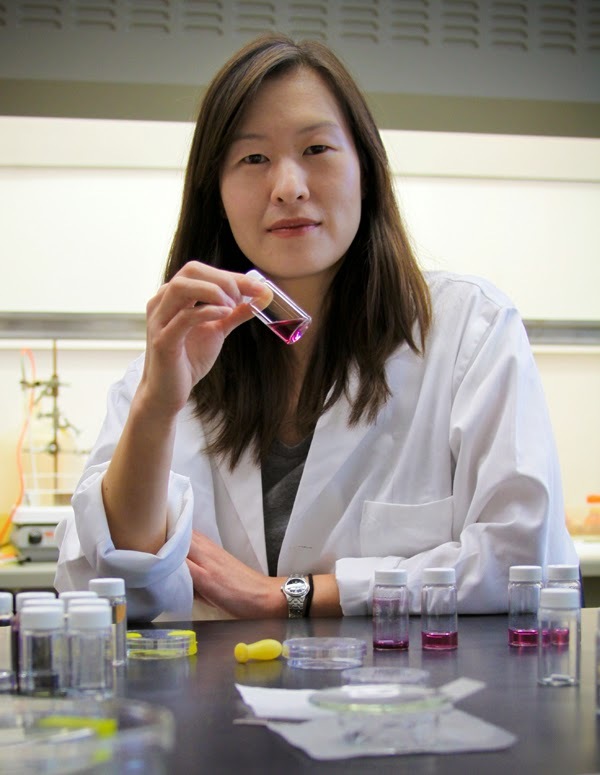 Andrea Tao, assistant professor of NanoEngineering at UC San Diego, was recently awarded a 2014 Young Faculty Award (YFA) from the Defense Advanced Research Projects Agency (DARPA) for her research project, "Plasmonic Nanoprobes for Neuronal Monitoring." nanoparticles have the potential to overcome imaging limitations of standard fluorescent molecules and dyes that used to label cells. 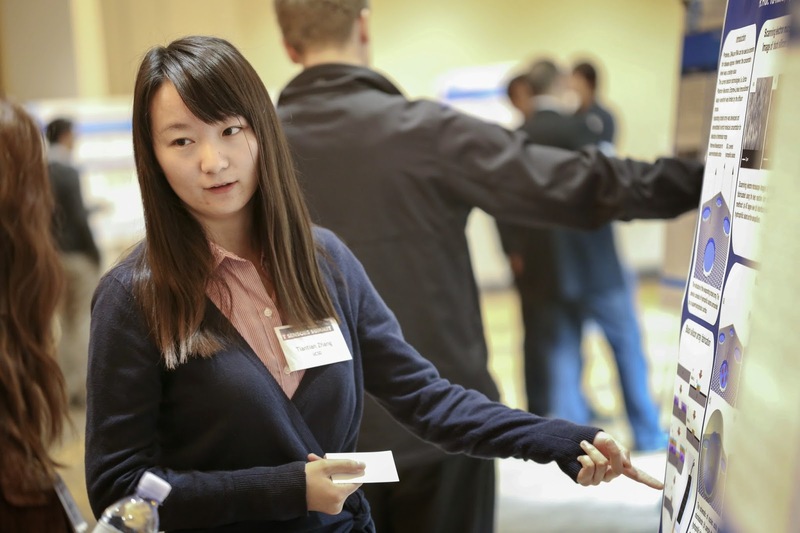 Prof. Tao was presented with the award at the DARPA Young Faculty Award kickoff meeting, October 3, 2014, at DARPA headquarters in Arlington, Virginia. The long-term goal of the YFA program is to develop the next generation of academic scientists, engineers and mathematicians in key disciplines who will focus a significant portion of their career on DoD and national security issues. 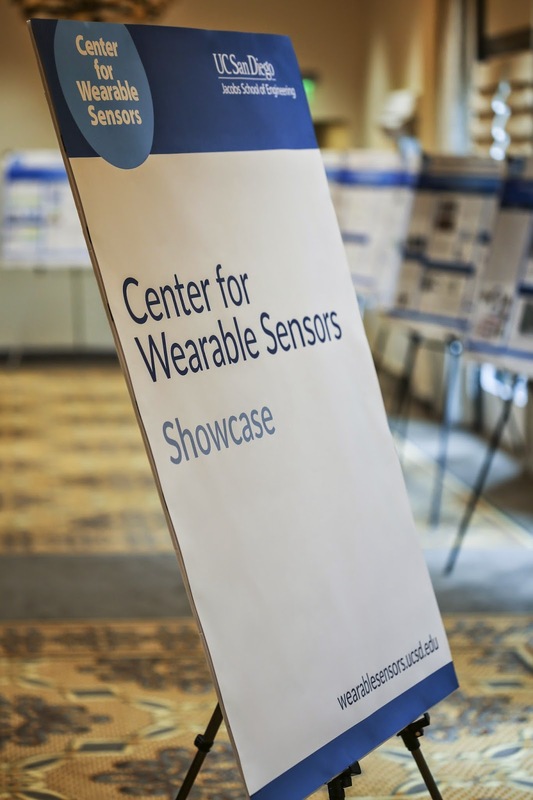 UC San Diego graduate students working in faculty labs that belong to the Center for Wearable Sensors presented posters last Thursday and Friday at the Trillion Sensors Summit in San Diego. Below are a few photos. More photos are on the Jacobs School of Engineering Flickr photo feed. Dean Pisano's thoughts on the future manufacturing base for a trillion-sensors world. Also, Electrozyme...a startup from Joseph Wang's lab was recently profiled in Wired. Aerospace engineering professor Mark Anderson and his students are working hand in hand with oceanographer Eric Terrill at the Scripps Institution of Oceanography to find a missing B-24 in the Pacific. The project is part of a partnership with the Office of Naval Research to find downed WWII aircraft and the remains of troops listed as missing in action for nearly 70 years. Other UC San Diego researchers joined the search in different ways. Terrill collaborates with Mark Anderson of UC San Diego’s Department of Aeronautical Engineering. Anderson has a background in aeronautics, flight trajectories, and statistics and was asked by Terrill to help with developing a predictive model for a missing B-24 that remains to be found. 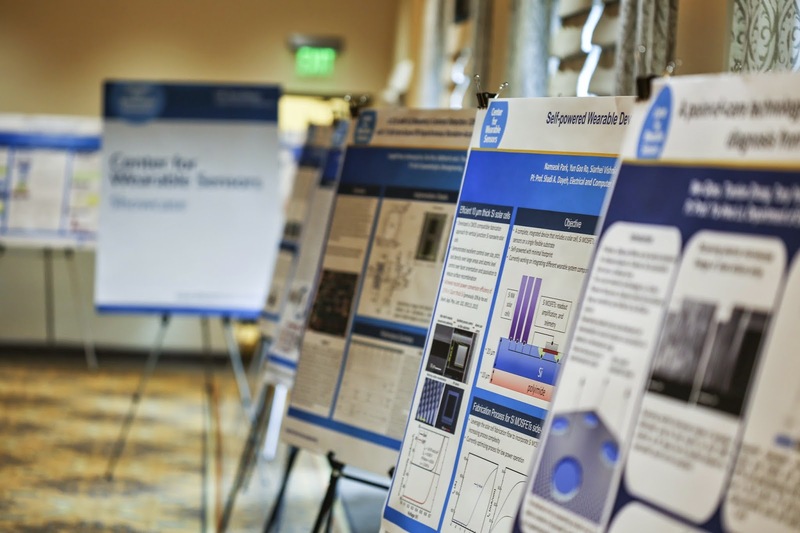 A group of engineering students was enlisted to run what are known as Bayesian models, using the best-known historic information collected by BentProp over the last decade. During the most recent expedition, the probability maps for areas where the plane might be located were routinely updated by the students (during their Spring break) based upon data collected by Terrill’s group that was relayed to them in San Diego. The plane remains missing, and teams remain focused on planning for a 2015 mission to complete their search. Terrill's efforts were featured recently on CBS news magazine "60 Minutes" and in a documentary by camera manufacturer GoPro. Stanford researchers tested an earthquake-resistant house on the shake table at the Englekirk Structural Engineering Center here at the Jacobs School this fall. The house was equipped with extra-strength walls and sliding isolators that allowed it to skate along the shaking ground instead of collapsing. The modifications are fairly inexpensive, researchers said. The researchers put the house through motions from the Loma Prieta earthquake, which had measured at a 6.9 magnitude on the Richter scale. More about the tests in this story from Stanford University News. Congratulations to MiP--a partnership between researchers in the UCSD Coordinated Robotics Lab at the Jacobs School and toymaker WowWee--which won a Best of What's New award in the Entertainment category from Popular Science magazine. In this TV segment on MSNBC's "Morning Joe," the robot gives host Joe Scarborough a run for his money. The device uses a set of multi­axis gyroscopes and accelerometers to remain upright. It can respond to gesture commands, zip around corners, and carry small items such as a soda can, all while remaining vertical. The best part? Users can network up to eight MiPs together for synchronized movement. Robot dance party! Much of the technology behind MiP's ability to balance on two wheels was developed here at the Jacobs School, lead by mechanical engineering professor Thomas Bewley. More about MiP here and here. As a side note, this is the second year that Nick Morozovsky, a Ph.D. student who just graduated from Bewley's lab, has a robot he worked on featured in Popular Science's Best of What's New. Last year, his robot SkySweeper won an award. "Being recognized two years in a row for the high-tech, but low-cost robots that we’ve been developing in the Coordinated Robotics Lab is awesome validation," Morozovsky said. "We have more robots in the pipeline that have the potential for an even bigger impact." Recruiters: heads-up: he is currently looking for a job! UPDATE: MiP has been nominated for a People's Play Award. You can vote here! Our colleagues at This Week @ UC San Diego asked Geno Pawlak, a professor of mechanical engineering, and Bill Griswold, a professor of computer science, about curiosity, passion and transformation related to their field of research. The answers featured surfing, sand castles and achieving humanity's full potential. 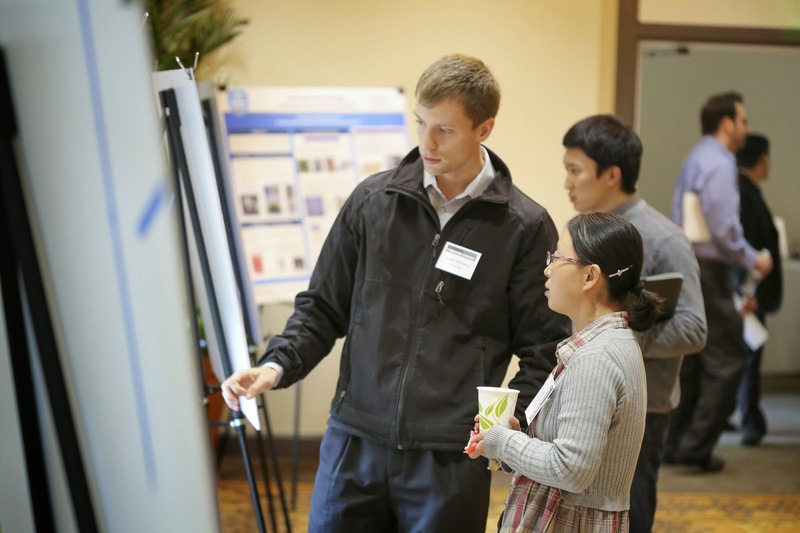 The two researchers were speaking at the Founders Symposium Nov. 13 here on campus. Read their answers below. What initially sparked your curiosity about this area of study? I grew up along the coast in Panama and have lived near the ocean and have surfed most of my life - so I’ve experienced first-hand the dramatic changes in the ocean that can occur due to storms, swell, pollution, etc. The Pacific coast of Panama sees tidal changes of 20 feet so you can see remarkable changes over six hours. I was also a sand-castle builder as a kid (and still am!) and so I was fascinated by the changes that came about due to waves and tides at an early age. Day-to-day, what fuels your passion for you research? On a very basic level, I think I’m passionate about understanding how things work. At a broader level, I’ve become more interested in applying this understanding to environmental problems, for example, making use of our knowledge of physical systems in understanding responses of biological and chemical systems in reef environments. What potential impact—or transformation—do you see coming from this research? My research is fundamentally about understanding physical dynamics of environmental systems, focused on connections between the coast and the open ocean. From an engineering perspective, this research has implications for predicting storm surge, tsunami inundation, water quality and coastal erosion. I believe the potential for transformative impacts arises from working across disciplines. I learned that there were just a handful of air quality monitoring stations in San Diego, and that we really knew so little about how air quality in the region was affecting the average person. I realized that recent developments in mobile computing technology and sensing devices would enable much more accurate and detailed sensing. Day-to-day, what fuels your passion for your research? I believe that with each advance in computing, we get a little closer to achieving our full potential. Computing technology holds the promise to enhance our humanity and our potential as human beings: our creativity, our intelligence, our reach and how we relate to each other. Students and their hunger for learning. I want to make their dreams come true. The opportunity to make this a better world for everyone. CitiSense (which leverages smartphones and the advent of cheap, compact sensors to enable real-time monitoring of air quality) is one example of how pervasive data collection and analysis can reveal the state of our world and how it affects our well-being on a daily basis. It's hard to perceive while we're in the middle of it, but a revolution is afoot. Jacobs School alums helping to fight illegal fishing in the Persian Gulf. A company founded by Jacobs School alums and now part of Digital Globe, a leading supplier of satellite imagery, wants your help to fight illegal fishing in the Persian Gulf. TomNod harnesses the power of crowdsourcing to analyze satellite imagery. In this instance, users will be looking for fishing weirs, structures made of stone, reeds or wooden posts, that allow water to freely flow in at high tide and trap fish when the tide is receding. The company has successfully used this technique in the past on several campaigns, including mapping damage from Hurricane Sandy and to look for the missing Malaysia Airlines flight MH370. TomNod is the brain child of alums Nate Riclin, Shay Har-Noy, Luke Barrington and Albert Lin. In advance of the Trillion Sensors Summit here in San Diego later this week (Weds and Thurs), UT San Diego ran a Q&A with Albert P. Pisano, Dean of the UC San Diego Jacobs School of Engineering: "Using Sweat to monitor your health"
An excerpt is below, and the full Trillion Sensors Q&A is available here. Q: What technology is emerging as a surprise? A: Well, there are a myriad of technology surprises sure to be had in this symposium, but the one surprise that truly shocked me is the presentation in which Professor Patrick Mercier (UC San Diego Electrical Engineering department) discusses how the energy gathered from the sweat from one-square centimeter of skin can actually run a radio (sensor). And it is used to transmit information about the health of your body! That's something I thought I'd never see -- sweat energy used to diagnose and transmit the state of health of the human body. And from such a small area -- about the size of a US nickel. You have got to admit, that's a truly surprising technological advance. 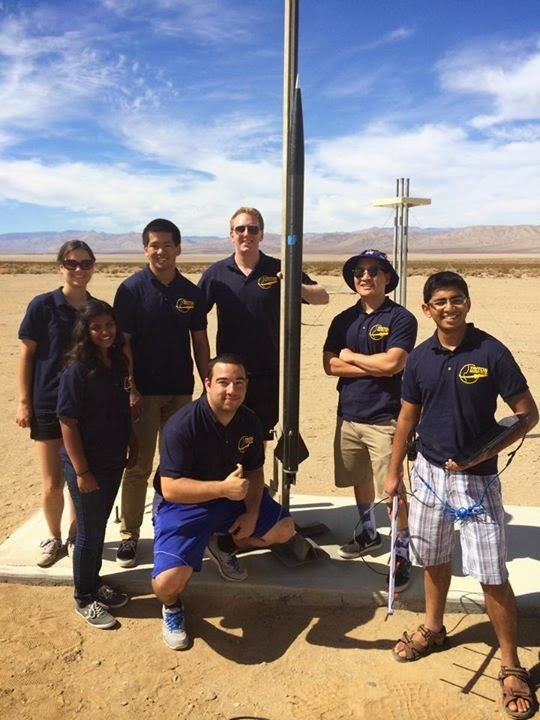 Update Nov 10: a related story ran in the San Diego newspaper, UT San Diego under the headline: "UCSD aims to send rocket into space"
Congratulations to the Triton Rocket Club, which placed second in this year's University Student Rocketry Challenge! It's all the more impressive that this was the club's first time in the contest. The goal was to fly a common payload consisting of electronic measuring devices weighting 3 lbs. to 10000 feet above ground level. Teams sent design and manufacturing reports pre-flight as well as post flight analysis and reports over eight months. The UC San Diego team actually built its own motor and static-fired it on July 19. "We wanted to stand out and be creative with our design," said Nicholas Montoya, the club's president. The team's rocket was made from a sleek, all black carbon fiber body with a fiberglass nose-cone. 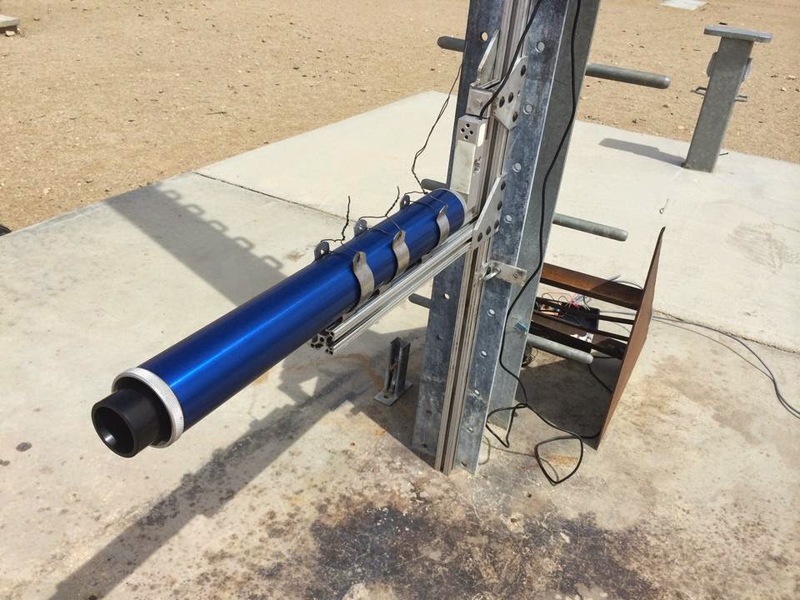 They launched it Oct. 4 at the Friends of Amateur Rocketry site in the Mojave Desert. The rocket reached a maximum velocity of 835 mph--or Mach 1.09--and a maximum altitude of 15,541 feet above sea level--about three miles high. Next up: a launch in Spring 2015, with the goal of reaching space, roughly 62 miles in attitude. The Triton Rocket Club is sponsored by NASA through the California Space Grant Consortium and by SPAWAR and Northrop Grumman Aerospace. The rocketry challenge is hosted by the national organization Students for the Exploration and Development of Space. 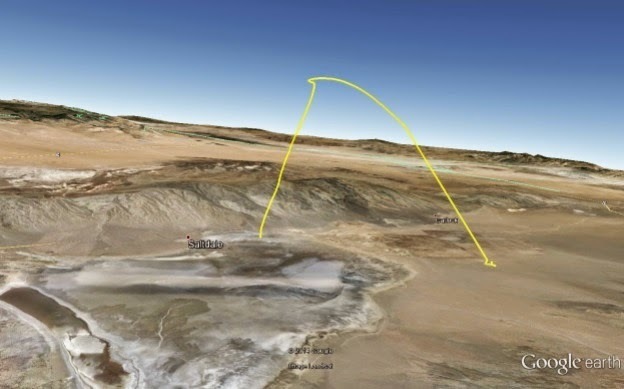 More pictures of the fun, as well as of the rocket's flight trajectory below. Marc Meyers, a professor of mechanical engineering here at the Jacobs School, shown at the start of his trip up the River of Doubt. Courtesy Jeffrey Lehmann. Marc Meyers, a professor of materials science here at the Jacobs School of Engineering, has been retracing Theodore Roosevelt's steps up the River of Doubt, 100 years after Roosevelt's expedition in the heart of the Amazon basin. Meyers is traveling with UC San Diego alum and documentary filmmaker Jeffrey Lehmann. They have sent two dispatches from their trip to UT San Diego. We were descending the river after the Naivete falls when we were met by a power boat carrying six (Cinta Larga) Indians. They did not respond to our friendly greetings and one of them photographed us. Upon arrival at the Cinta Larga Village, Sargent Douglas, our contact in Vilhena, told us that there was trouble. Soon an Indian wearing a feather headband and followed by a group of children crossed the bridge. Joao Brabo ( Mean John) faced us and, with a stern posture, stated a long discourse in his native language, staring at us with anger and contempt. |We did not understand the words but the tone was clear. We did not have the right to invade his lands. The meeting resulted in a 100-mile detour for Meyers and Lehman, who continue their journey. Their first dispatch, written by Lehman, describes some of the other difficulties they encountered, including torrential rain and rapids. The afternoon brought mosquitoes and bees to annoy us and we set camp in the clearing, after assembling our Pak Canoe. We got up at daybreak and initiated a descent in a narrow and dangerous stream. The river, less than ten yards in most places, was littered with fallen trees and branches. This required constant navigation and more than one brush with a perilous branch that could easily have punctured our canoe or toppled any of our watercraft. Every now and then a buritizinho (palm tree) lay across the stream, exhaling a sweet essence. Macaws flew over us periodically, and the birds were the same ones that Roosevelt had reported. We can't wait for the next installment of their adventures. Nanoengineering professor Joseph Wang's Laboratory for Nanobioelectronics has developed microrockets that can neutralize chemical and biological agents such as sarin and anthrax. The microrockets can also decontaminate environmental waste. Image courtesy of American Chemical Society. The research team's work was published recently in the journal ACS Nano and has been getting a lot of attention in the media. The rocket is made from magnesium coated with titanium dioxide. A small eye-like opening exposes the magnesium which reacts with the seawater causing a "bubble propulsion" effect which powers it forward. This propulsion then enables titanium dioxide to react and break down chemical and biological agents. Titanium dioxide is already known for its amazing ability to break down pollutants. It has previously been used for self-cleaning windows and engineers have even coated cotton with the chemical in an attempt to make clothes clean themselves. Joseph Wang and colleagues from UC San Diego point out that titanium dioxide is one of the most promising materials available for degrading chemical and biological warfare agents. It doesn't require harsh chemicals or result in toxic by-products. Current approaches using titanium dioxide, however, require that it be mixed in whatever solution that needs to be decontaminated. But there's no way to actively mix titanium dioxide in waterways if chemical and biological agents are released into the environment. So, scientists have been working on ways to propel titanium dioxide around to accelerate the decontamination process without the need for active stirring. But approaches so far have required fuel and other compounds that hinder neutralization. Wang's team wanted to fix this problem. Read more in Inside Science. Kudos to teaching professor Justin Opatkiewicz for his Halloween costume this year. 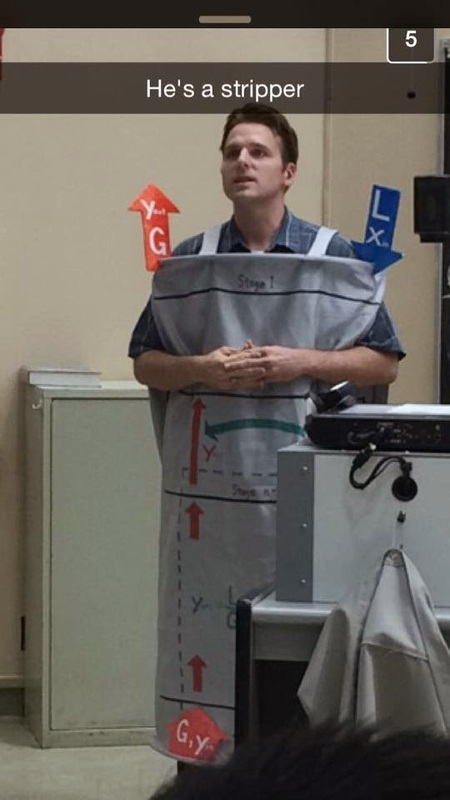 He came dressed to class as a--chemical engineering--stripper (see picture above). For those of you who are not ChemE majors, that's "a physical separation process where one or more components are removed from a liquid stream by a vapor stream. Stripping is usually carried out in either a packed or trayed column," according to Wikipedia. Wonder how he's going to top this next year?